Aside from the plethora of cultures in which Turkey is renowned of, it can also take pride of its rich culinary inheritance. 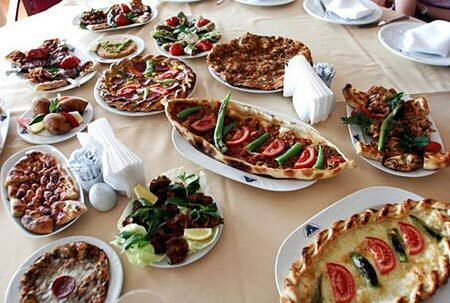 Turkish food is regarded as one of the world's great cuisine along with Chinese and French cuisines. The tourists who are travelling to Turkey are lucky to discover not only her natural beauties, historical and archeological sites but also savor her food heritage as well. History states that it was during the height of the Ottoman Empire’s reign when the formula of Turkish cooking extended into Eastern Europe, Egypt, and Inner Asia. Over the centuries, Turkish cooking and ingredients spread throughout the Middle East. Some of the greatest influence from Turkish cuisine includes yogurt salads, fish in olive oil, stuffed vegetables, and honeyed desserts. This is why to eating Turkish food can be equated to dining on centuries old recipes which are refined though time. In addition to being a refined outcome of centuries of practice, Turkish cuisine is of pure quality. The beauty of Turkish cooking lies in its affordable recipes, use of ingredients which are easily identifiable and can be acquired fresh, and the ease of cooking techniques used. The simplicity of the recipes along with the use of quality ingredients guarantees the production of delicious and healthy meals. The dishes are also presented simply with no excessive decorations, but they look delectable nonetheless. Turkish cuisine has lots of specialties and variations. When dining in restaurants, ask for the region’s specialties, and you will not be disappointed. Take for example Adana in Southern Turkey, it is well-known for "Adana kebab"—a spiced minced meat. Kebabs are dishes of plain or marinated meat and are either stewed or grilled. Istanbul is known for its appetizing "midye" or pilaf stuffed mussel meze. Mezes are appetizers used mainly to stimulate the desire for food before the meal proper. In the Black Sea region, they have a palatable dish of rice and small fish called "Hamsili pilav". "Pilav" is a rice dish which is not easy for to prepare for an inexperienced cook. Turkish sweets such as "sutlac", "helva", "kazandibi" and "asure" are also famous all over the world, but the best-known are "baklava" and "kadayif" pastries. Most of these luscious sweets have milk as the essential ingredient. If you are interested in ethnic foods that are both healthy and delicious, come and try the Turkish Cuisine. Cut the chicken breast in cubes. Boil the beans for 30 minutes. Drain the water and let it cool. In a deep sauce pan melt the butter. Saute the chicken breast for 5 minutes, then add chopped onions. Saute the onions for another 5 minutes with chicken, then add the chopped tomatoes and continue sauteing until tomatoes are soft. Add the salt and the chicken stock to the saute pan. Boil everything for about 15 minutes. Transfer everything with the cooled beans to a casserole dish. Bake in a preheated oven until the beans are soft. 350F for about 1 to 1 1/2 hours. Serve with rice. Cut the goose into sections. Put into a saucepan with enough water to cover and boil. Strain and set the goose aside. Chop the onion and tomatoes. Pell the gibsons. Peel the potatoes and fry in 2 tablespoons of butter. Put the goose and onions in the saucepan. Add 2 tablespoons of butter and saute, constantly stirring untill the onions turn golden. Sift some flour into the saucepan and fry the goose over a moderate heat. Put the tomatoes and a glass of stock into a saucepan and boil, then simmer lightly. Add the tomatoes and stock to the goose with the gibsons. Season to taste. Stew and check occasionaly with a fork. Add the potatoes 2-3 minutes berfore cooking is over. roasted turkey recipe below. thanks. Choose a good quality, quick roasting bird. Peel the onions and carrot, and cut them into 4 pieces each. Put the Turkey in a pan with the onios, carrot, margarine, peeled garlic and water. Cover and put on heat. When the water starts boiling, remove the pan from heat and put in a hot oven. Some time later, turn the turkey over and cook until it becomes tender. When the turkey is tender remove the cover. Baste the turkey occasionaly. When cooked, take the turkey out of the oven, put in on a serving dish and separate the different sections (breasts, legs, wings etc.) Puree the sauce remaining in the saucepan and serve the roasted turkey either topped with the sauce, or serve the sauce separately. Open the quail by cutting along the backbone. Remove the spine and ribs. Flatten the meat and season. Prepare a moderately hot barbecue coal fire and place gril 4-6 inches above the barbecue. Put the birds on the grill and grill both sides. Grilled quail is served with potatoes anjd/or carrots for garnish.